Hey guys, sorry i've been somewhat MIA this past week. I'm in California shooting a project ( I wish I could talk about it, but it's hush hush at the moment) Follow my travels on Instragram though for more! Wore this outfit last weekend when meeting up with some of my girlfriends at B Bar for dinner it was my attempt at being a woman and dressing my age...I don't even know what that means but I like to throw that phrase around every now and then. Absolutely in love love love with my new mini cross body purse by Mi Piaci, It comes with a beautiful gold chain that wraps around as well, but I took is off for dinner. I'm still faithful to my oversized carry everything bags,m but in the summer a small bag is the first thing I grab when leaving the house. Hope everyone is having a great June can you believe it's coming close to an end...and that my birthday is not even 2 weeks away....whaaaat???? I wish I could go back to Biarritz and celebrate my birthday home with my friends. This is the 2nd year I will be in NYC...If I had it my way all my buddies from NYC would be with me in BTZ drinking and surfing on the beach(just thinking about it makes me teary eyed...miss you les PM. love your look as always! I LOVE the details and patterns of your skirt! Also, that jacket is amazing. Good news, its sunny in NYC! No more rain, that means when you get home it will probably still be sunny! Can't wait to see what you have been shooting! Love these photos! Great style. gorgeous outfit and you look stunning! I just adore your hair! Love that top on you. So pretty. Thank you for always looking AMAZING!!!! What a great skirt. Exciting that your birthday is so soon! Biarritz is so beautiful! Wow these colours really suit you, beautiful top, dress and jacket! I am absolutely loving that skirt! Really love your leather jacket- I've been lusting over an Acne one for a while. Looks good with everything! 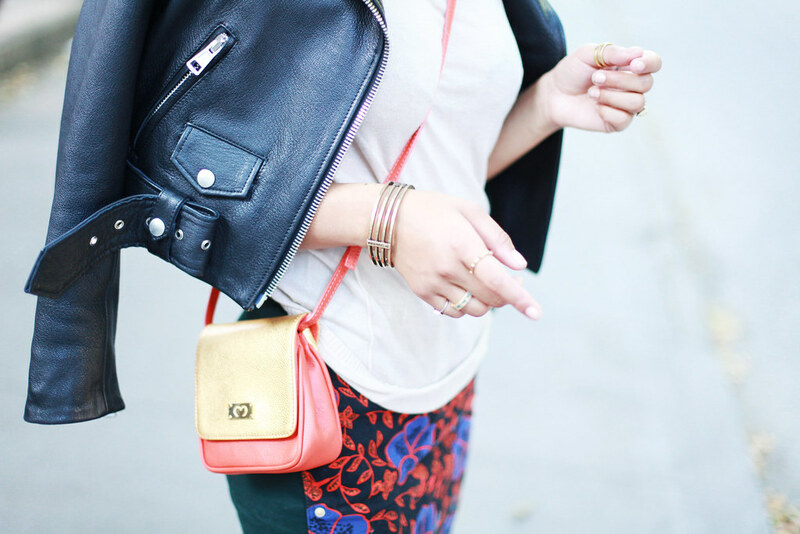 super cool jacket and purse, love the combo : ) Headed to your Instagram now to check out what's going on! Missing you too mon chat. I notice you never really fully put your jacket on. It's always on your shoulders... is there a reason? love this outfit and how you paired a tee with such an elegant skirt. and what a skirt it is! you dress exactly the way i´d like to. <3 it!